Finding data on actual European Union energy use tends to be difficult in published energy reports. 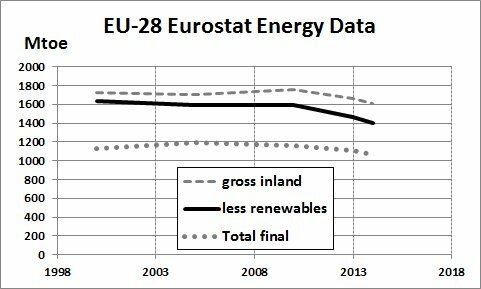 Official data are available from Eurostat though, and the most recent data update was published in January 2016.
reflected in reductions in EU-28 energy use after 2010.
subtracted from "Gross" energy in the year 2014 for the EU-28. The effects of economic slowdowns on energy use can be interesting.